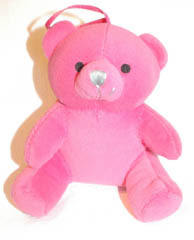 This Pink Little Love Bear used to live at Victoria's Secret, and now this cutie can come live with you. Each bear measures 3.5 inches by 3.5 inches and just begs to be squeezed. Shipping and Handling is included. This item is shipped regular mail, not US Priority or US Express, unless you choose to upgrade separately ($8.50 for US Priority and $32.50 for US Express).